To begin viewing your "Tax Info Report" go to the "Reports" tab and click "Tax Info Report" in the "Finance" section. Next, you can choose the year for which you'd like to view a report. Income is generated from your sales invoices. 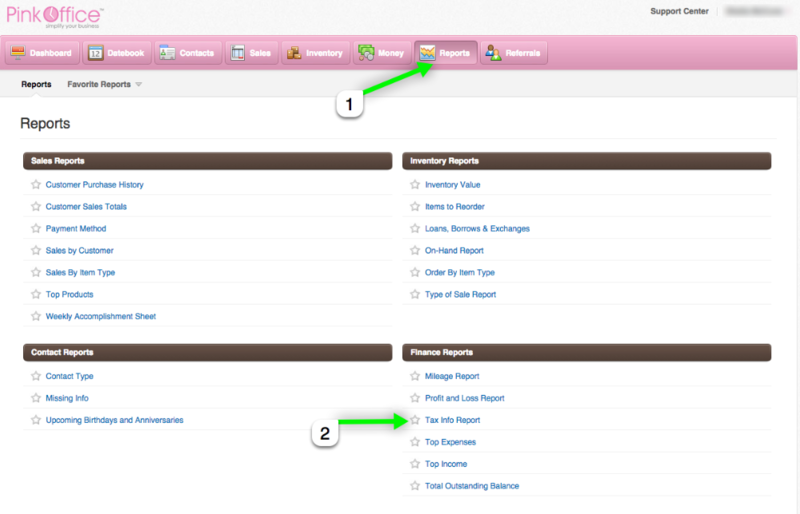 Every time you create an invoice in Pink Office the sale is recorded in the Income section of this report. The row titled "Retail Sales Income" is the amount of money you actually collected. To see the amount of retail product that left your shelf for contest purposes please view first column in the "Total Sales by Item Type" row at the bottom of this report. The "Sales Tax Collected" row also comes straight from your invoices. This is a total of all the sales tax on every invoice for that time period. The Shipping Income is also from your invoices. If you charge a customer shipping, enter that on an invoice and it will appear in this row as shipping income. Next we have the break down of sales by "Type of sale." This bottom section of the report is a closer, more in depth view of the information above. Notice in quarter one for this consultant, her retail sales before discounts were $2621.50. That is the amount of retail product that left her shelves, this total can be used for contest purposes but does not reflect retail income as does the above total. Now subtract the amount in the discount row, $1131.74. You will get the total of $1489.76, which you will notices is the same amount as her "Retail Sales Income" recorded at the top of the report. Last, you will see the "Non-recovered Sales Tax" column. Non-recovered sales tax is recorded when you charge less tax than you paid. This is likely to happen if you sell products to customers that are not local to you. 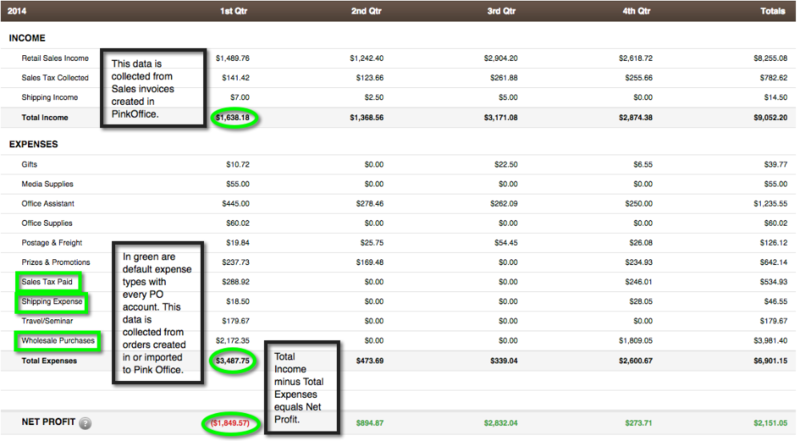 This section of the report allows you to see where you are making or losing money. Is there too much personal use or gifts? Maybe there isn't enough. It is very important to know your numbers! Last we have the purchase totals by section. Again, this is an in depth view of information found earlier in the report. Notice the line in the Expense portion above titled "Wholesale Purchases." This includes both section 1 and section 2 purchases. In this section below you will find a breakdown of purchases by section. Section 1 and 2 are separated then recombined with the same total found above.